Our ingredients are of the highest quality to meet your needs. Whether you require processed cheese or other ingredients, we can help. 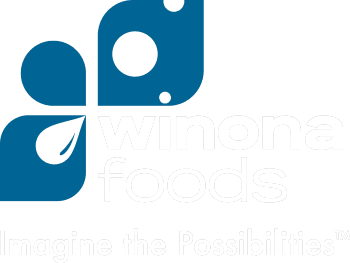 Winona Foods knows cheese and provides solutions for our customers' diverse needs for food ingredients and food processing. Our expertise doesn't stop with cheese ingredients. We also create sauces, concentrates and IQF portions for any foodservice need. Our packaging capabilities are only limited by your imagination. Whether its shelf stable, refrigerated, or frozen ingredients your business requires, Winona Foods can customize a great-tasting and effective solution to help you grow sales. Feather shred, Julian shred, Fancy shred, and Diced. Cheddar, Monterey Jack, Swiss, Pepper Jack. Natural and Processed slices. Twin-stack, Rapid-Pack. 5 pound and 10 pound. Cheese, Red and White Sauces, Fruit and Sour Cream Dips. 40, 75, 150, 500, 1000 pound. Our ingredients are of the highest quality to meet your needs. Whether you require natural cheese ingredients or processed cheese, we can help. Contact us today and ask us how we can help with your next project.